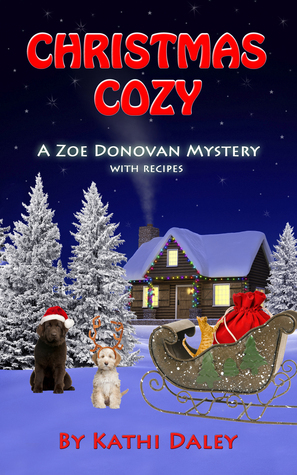 Opening a Zoe Donovan mystery is like coming home. The mountain town of Ashton Falls is idyllic, featuring cozy cafes and small, charming shops. Whenever I return for a story, I find myself wishing I could live there and be friends with Zoe, Zak, Levi, and Ellie. If only the crime and murder rate weren’t so alarmingly high! As Ashton Falls gets ready for Christmas, Zoe is helping Levi at a Christmas tree lot to benefit the high school where Levi coaches. Right before the lot is set to open, Zoe finds a body on the site – and not a living one waiting to buy trees and wreaths. As the police (and our favorite small town sleuth, Zoe) investigate, the murder of high school teacher Holly Jolly becomes more and more sad and disturbing. The victim had been a part of the town for many years, but no one really knew or befriended her. A fact that only spurs Zoe on to find the killer. As the investigation continues, Zak and Zoe care for their two nine-year-old visitors, as well as their friends (both tw0- and four-legged!). In the way only Kathi Daley can create, Christmas in Ashton Falls is a chaotic, crazy, cozy, and very merry affair. Enter using this Rafflecopter link to win either a paperback copy of Christmas Cozy and a mug OR a Kindle copy of the book and a $15 Amazon gift card! Contest runs December 11 – 17. US winner can select either prize. Non-US winner will receive a Kindle copy and $15 Amazon gift card.